The last three articles concern the meaning of Tarot as crazy. while Italian literature is imaginative, the work quoted here does not imagine teaching chess, etc., to dolphins (although why not?). In Italian "delfino" means both "dolphin" and "heir apparent", borrowing, I think, from the French "dauphin". During his Christmas break from teaching, Andrea had time to work with me on improving the translation of his old iconological essays, as well as updating them in line with information that has come to light since and removing material that while interesting was not currently verifiable, at least by us. These essays were originally written some time ago. We managed to get through eight of them, all of Popess through Hermit (although there are some slight revisions yet to be inserted into Justice). When Andrea has more time we will continue. I personally hope that the old versions will continue to be available on trionfi.com, as we might have removed material that is still of value. They just occasionally have what seems to be outdated information, or arguments that could be stated or organized more effectively. And their English versions are rather awkward and sometimes unreliable. For quotes from common Christian sources, for example, I have inserted standard English translations from the Latin instead of trying to translate Andrea's Italian translations from the same source. In general they are better than anything I could hope to come up with. In other cases there are the usual interchanges between us until we get something that seems right to both of us. April 2018 additions to "The Prince"
Andrea has made some important additions to his essay "The Prince", which of course is about the origination of the tarot in Bologna by Prince Fibbia, now translated at http://www.letarot.it/page.aspx?id=107&lng=ENG. The other addition is in footnote 27, where he cites a 1754 book quoting from a 1677 book attesting that the game of tarocchi (not tarocchini) was invented in Bologna. Also, what he has in mind is clearly not the version with four "papi" because he refers to the Pope card, singular as an improper subject in the deck. He dates the "invention" in Bologna to "the time when the Bentivoglio exercised princely power". If taken literally, that would be no earlier than 1442, the first year the Bentivoglio exercised more than brief supremacy in the city. We know that a game called "trionfi" existed elsewhere before 1442. But perhaps he is thinking of even occasional rule. Be sure to read what this source has to say. Marco translates the passage in question. 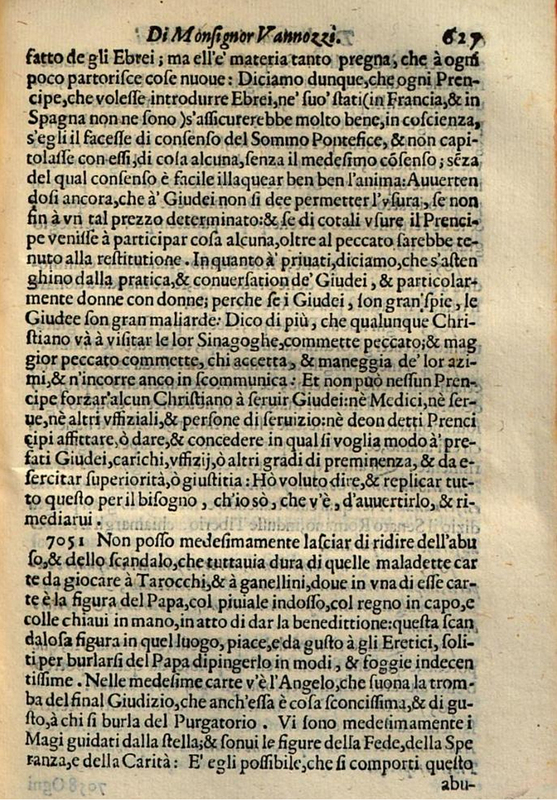 The author, Legati, cites a 1613 text by Bonifacio Vannozzi, which I quote in the thread (post 7). I do not take Legati or Vannozzi as positive evidence that there was only one Pope in the Bolognese cards they saw. I take it that they saw the cards, saw a Pope among them, and were scandalized. The issue for them is not the number of Popes, but that there is any Pope at all. We know from Mitelli's rendition of the pack that there were two Popes and two Emperors, although for some reason Legati is not offended by their presence in Mitelli's version. Vannozzi is also scandalized by the presence of the Angel of Judgment and the three Magi in the Star card. He would have to wait over a century for ecclesiastical authorities to force a change. Re: April 2018 additions to "The Prince"
Thanks for the link to the 2013 discussion, Ross. As usual, I had forgotten to see if anything had been posted on the subject on THF. Looking at it, I do remember it now. Your comments, and the quite well documented thread, will take me a little time to digest. 12 - Tutti questi Guochi di Carte furono dedotti da quello de’ Tarocchi, inventato, com’è fama, in Bologna, e, più che altrove, praticatovi, quando i Bentivogli, v’esercitavano autorità di Principe. Testimonio di che sono le qui serbate. 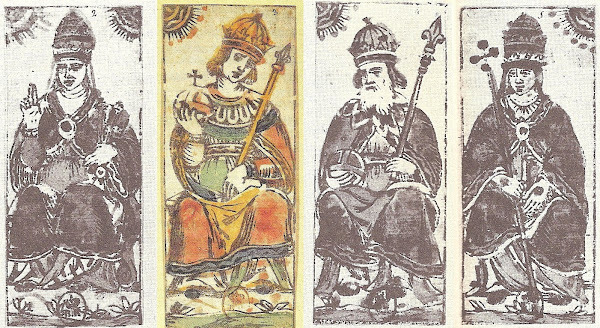 (12 - All these Games of Cards were derived from that of the Tarot, invented, as is known, in Bologna, and, more than anywhere else, practiced there, when the Bentivoglio exerted the Princely authority. The cards presented here give testimony. In 13 he says these tarocchi cards are at least 170 years old, i.e. 1507 or earlier. 1507 is when the Bentivogli (plural) lost the "princely authority" they had been exercising. "Princely" means as rulers until death or abdication, passing down the rule through the family, father to son. This is in fact how the Bentivogli ruled in 1442-1507, a privilege granted by the Signoria of the city. I don't think that "Princely authority", "autorità di Principe, " includes one or two years here and there as governor. ; at least we can't assume that it does. Moreover, in item 12 (adding the part about the age of the cards) all he is saying, besides that the game had been invented in Bologna, as "è fama," is famous (I translated it "as is known" and Marco as "as they say"), that it had been played more in Bologna than elsewhere, and in at least some of the years the Bentivogli exercised that authority, before 1507. All that is really attested is the popularity of the game for a substantial period before 1507, and the general knowledge that the game had been invented in Bologna. There is on the side of the page a note referring us to items 7057 (actually 7051) in the appended material by Ulisse Aldrovandi, Ross (viewtopic.php?p=14263#p14263) tracked down that reference, in a work originally dated 1613, otherwise noteworthy for its mention of genellini (found by Huck earlier). It can be ignored on the present issue, because Legati is merely referring the reader to Aldrovandi's similar complaint about the Pope being in a deck of playing cards. Yes, I know they aren't concerned with how many popes there were in the deck. But they both say "il Papa" instead of "i Papi". And it seems like they would be scandalized also by there being more than one, as though the deck were promoting schism, or making fun of the bad old days, when there were two or three popes each excommunicating the others. Ne il Papa tien qual Bagattin, o Matto. C’è un solo Papa, come a dire che ne basta uno per designarli tutt’e quattro, dal momento che nel gioco avevano lo stesso valore. So I guess if one serves for four in a poem, the same can be true in a description--even if there is less "poetic license" there. So, yes, from Legati we can conclude nothing, if this was indeed the practice, odd as it sounds to me, since in fact there were two in papal gear and two in imperial gear. I wonder, if the word "Imper" in the sonnet is meant to designate the imperials. That would still leave two, however. So the Pope is only that one. The other one has a book and a staff, like the PMB Popess except in vestments. Well, Vannozzi was a Cremonese, used to calling only one card the Pope, namely, the one doing the blessing, as we see in the PMB. Is he imposing Lombard terminology on Bolognese practice, or reflecting actual Bolognese practice, in calling only one card the Pope? I tend to think the latter, because he's been in Bologna a while, but I really don't know.